Armistice Day, held on 11 November every year, commemorates the signing of the armistice between the Allies and Germany at 11am on 11 November 1918 - the eleventh hour of the eleventh day of the eleventh month. After the end of World War I, Armistice Day was marked each year by a two-minute silence at 11am, a chance for people to stop and remember the 20 million who died during the conflict. Now the two-minute silence is more often held on Remembrance Sunday, the Sunday closest to Armistice Day, which is a day of remembrance for all those killed in war. 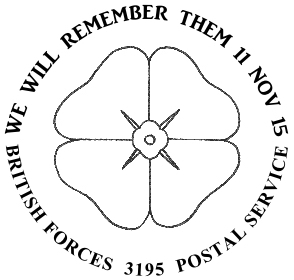 For the first time, BFPS will issue a special commemorative cover on the 11 November 2015 to mark this poignant event. The main image of this thought-provoking cover is from an original oil painting by Army artist Richard Salter. The Royal Mail issued stamp ‘Poppy’ has been used and will be cancelled by the exclusive ‘We Will Remember Them’ special handstamp, designed especially for the occasion. The postmark also bears the unique serial number ‘British Forces Postal Service 3195’.